Thank you to Colleen for the invite to participate in this photo gallery. My sister, Lorraine, is the tree decorator in this house. She has such a grand time so my brother, Mitch and I simply stay out of her way, lest we end up decorated ourselves. Lorraine not only decorates the tree, she decorates everything (pretty much) in the room. 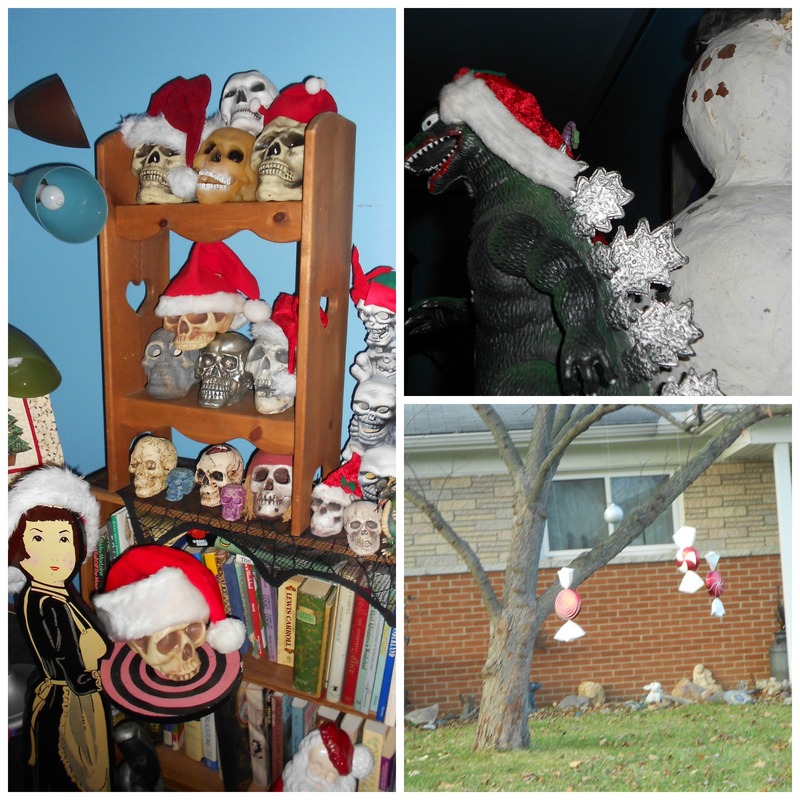 Yes, those are Santa and elf hats on skulls… Dinosaur? But of course! We are located in Westland which is in the great State of Michigan, smack dab in between Detroit Metro Airport, Ann Arbor, Detroit and Dearborn (roughly 25 minutes from any one those destinations for those who are Michigan savvy). 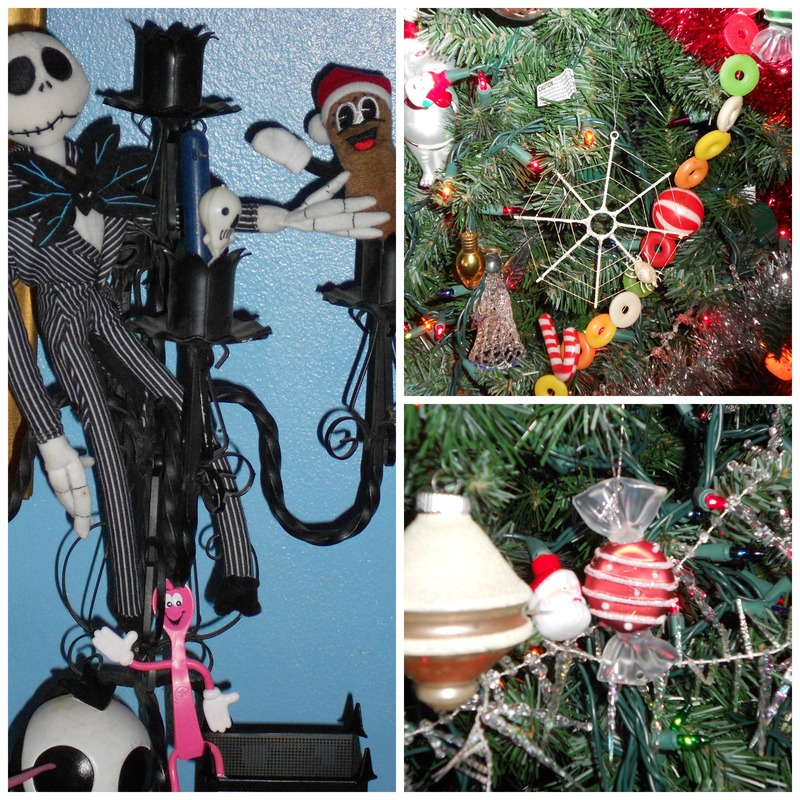 Many of the decorations have been in our family for decades and believe it or not, she adds new things every year… No wonder she loves decorating even the outside trees as well as creating trees out of practically ANYTHING in the house! 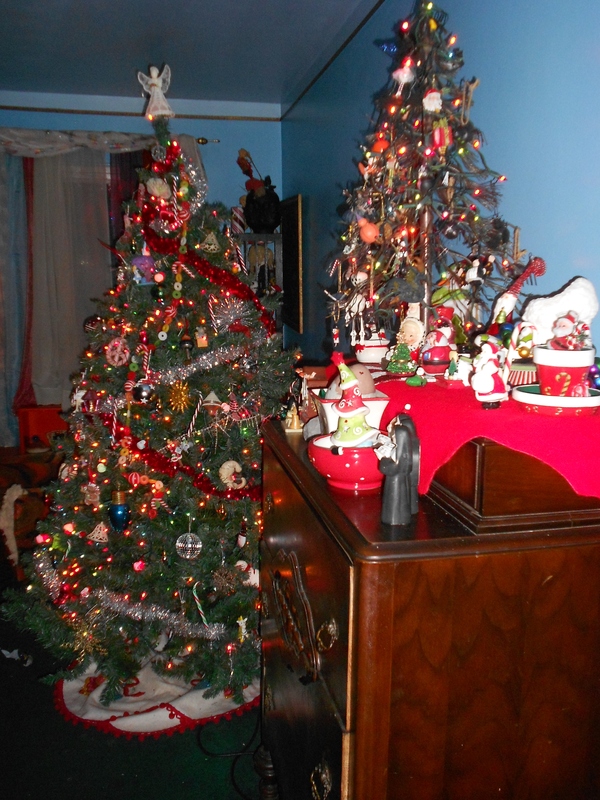 This entry was posted in Just Stuff and tagged #1 Best Selling Author Annette Rochelle Aben, Christmas trees around the world, decorations, Detroit Michigan, Lorraine Parent, silver threading, Westland Michigan. Bookmark the permalink. Happy to be part of the elves! I have a similar highboy made of veneered wood from the depression era. It belonged to my grandmother. Unfortunately I don’t have the rest of the bedroom set. I love your little table top tree. The first Christmas trees were table tops in Germany I think. A small tree would be ideal to decorate as a Bridal or wedding tree with certain symbols for the happy couple. A basket of fruit, a basket of flowers, a teapot, a star, a house, a rose, a rabbit, an angel, a dove, Santa Claus, a heart, and a fish. Cheers to you and yours! Merry Christmas and a Happy New Year to us all! I always wanted a little German feather tree, and I know companies still make them. A German Feather tree? I must look that up, it sounds interesting. The German families were cutting down christmas trees in the Balck Forest and it became a crime to do so, so they began making the first artificial Christmas Trees. The were rather stiff with straight dowels wrapped around with green dyed feathers. How long does it take your sister to put up all those decorations, Annette? They look amazing. I participated in Colleen’s tree challenge too, and I think you’re sister and I have a lot in common. The first year my boyfriend and I put our tree up, we didn’t have a topper, so we used a pig skull he’d painted. He’s a chef and an artist (just to clarify how that came about). Anyway, I LOVE your decorations! Thank you! Sisters are the best aren’t they? Happy Holididays to you, as well! This is great preparation for Christmas. I wish YOU and ALL at Home a Grand & Happy Christmas. Thank you for the beautiful wishes and may we extend the arm of comfort and joy to you and all those who mean the most to you!